What is my epiphone acoustic? Hi, I have an older Epi acoustic that has a unique headstock logo. 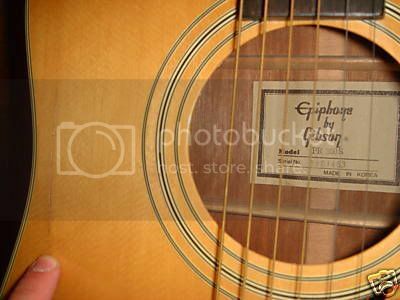 In pearloid it reads Epiphone then under Epiphone it reads by Gibson. This is all in pearloid on the headstock. It does not say Gibson on the truss rod cover, that is plain. The model number os a pr350. It has snowflake fret markers. 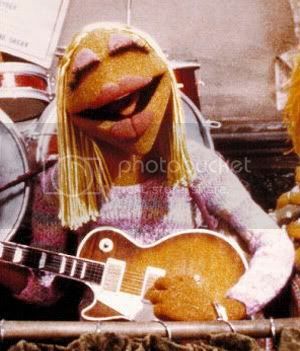 I'd like to know if anyone knows anything about this guitar and what year these were made? Epiphone[/i] it reads by Gibson. This is all in pearloid on the headstock. It does not say Gibson on the truss rod cover, that is plain. The model number os a pr350. It has snowflake fret markers. I'd like to know if anyone knows anything about this guitar and what year these were made? Epiphone moved its acoustic production to Korea in 1983 and in about 1986 they also began electric production there with the Sheratons and Tele-Phones and Epi-casters and at about this point in time they started using the "Epiphone By Gibson" headstock logos on all of their Korean-made models and continued to do so for the next couple years so the guitars with the "Epiphone By Gibson" were made in Korea (by Samick) between 1986-1988. The "PR" or "Presentation" line of Epiphone acoustics actually began in Japan about 1979 but was moved to Korean with the other acoustic models in 1983. The reason the Korean-made models had the "Epiphone By Gibson" logo also was because there was still some electric guitar production still going on in Japan and the different logos differentiated the two countries of manufacture. For the most part there's little difference between the "Epiphone By Gibson" and the later plain "Epiphone" models. This is a 1988 PR-350(S-for solid top)...so now I'M really confused.. Does your guitar's interior label look like this? this is from a late 70's/ early 80's Japanese-made Epiphone that I thought didn't fit in with the "all acoustic production went to Korea in 1983" thinking. since it dates to July of 1984 according to the serial number format but those numbers can be iffy at best. I'll keep looking into it but I can't promise an answer. I have a PR350s vs and the sticker on the inside does not say Japan or Korea. It was a gift from a family friend and I just dropped it off for a tune up so I don't have the serial number on hand any body know what the vs is all about? Acoustic guitars have a hollow body like acoustic instruments, but they also have electric pickups mounted directly onto the body. The purpose of an acoustic electric guitar is to get the tones of an acoustic, but with an increased volume. Any body tell me what year my PR350S VS is it has an oval sticker on the inside, the serial # is S96070026?? This is my Guitar and I love it...but...is a good guitar for the experts? The guitar is wonderful, perfect sound, beautiful harmonics and keep the tune for a long time. However, at first glance is hard to play (blisters on the fingers for the rookies) but the incredible sound it's the reward. After all, it was my first guitar and I'm really satisfied. This is my first post, I'm from Chile. I have a Korean PR350S from Jan, 2002. Looks a little different from yours. Different headstock shape, and the body just looks different, somehow. It's a solid top, really nice tone, but not real loud. I broke the headstock off, almost two years ago, but still can't bear to part with it. Mine was easy on the fingers, after setting it up myself. 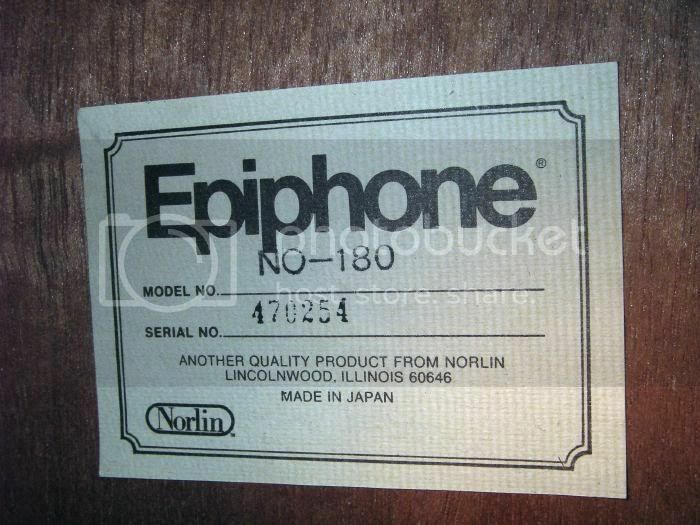 I can't say for sure about the move from Japan to Korea, but when they moved Epiphone production from Kalamazoo to Japan, the labeling and serial numbering got confused. In fact, K'zoo labels, reading "Union Made" have shown up on some early Matsumoku made guitars from 1971. The apparent intention was to line out the "Union Made", then stamp the blue K'zoo labels "Made in Japan" next to it. At least one, I've seen, got out of the factory without the edit. This editing was done until pre-printed "Made in Japan" labels could be procured. Something similar may have happened here. Also, the Matsumoku serial numbering system was anything but serial. Not sure what it was, but determining a year of manufacture for Matsumoku made guitars is next to impossible. "Fair" is never "Even" --- me again. "The closer you get to civilization, the less civilized humans become" --- me again. "Never be afraid to try something new. Remember that the Ark was built by a lone amateur and the Titanic by a staff of highly educated, highly trained engineers." ... Jimmy John's.